Kicks is the first compilation to exclusively concentrate on the Raiders at the absolute peak of their hit making powers. Before we go any further, here are some statistics worth pondering. During those all important years between 1965 and '69, the Raiders scored no less than 16 US hit singles, were the first rock act to be signed to Columbia – for whom they released eight albums – and, on the top of all this, had their own network TV show Where The Action Is. 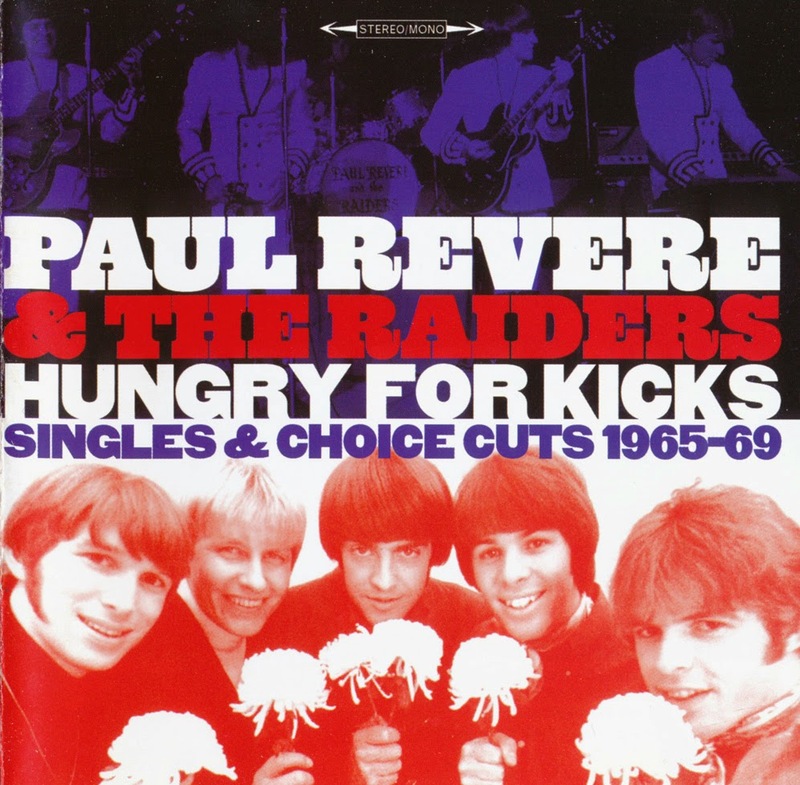 Built around the partnership of Paul Revere, Mark Lindsay and co-songwriter and producer Terry Melcher, the 27 tracks on Hungry For Kicks represent no less than the absolute golden age of Raiders pop, if not American mainstream ’60s pop in general. The band's habit of dressing themselves up in cheesy matching band outfits not to mention the notorious American Revolutionary garb may to a degree have compromised their credentials as a serious garage act but the real proof of the pudding lies in the quality and quantity of the selections showcased here. Sequenced in non-chronological order the track listing literally bounces its way around between the twin landmarks of the Raiders' ’65 breakthrough 'Steppin' Out' and their last single release of the decade, the soulful 'We Gotta All Get Together' from late '69 with original (and often markedly different) single versions rubbing shoulders with a selection of the Raiders' most happening album tracks and a rare radio promo from ’67. Whether its the out and out garage frenzy of 'Kicks', 'Hungry', 'Just Like Me', 'Steppin' Out', 'Louie, Go Home' or Boyce and Hart's 'I'm Not Your Stepping Stone' (which actually predated the Monkees’ hit version) or the more psych-tinged 'I Had A Dream', 'Peace Of Mind', 'The Great Airplane Strike', 'Why? Why? Why? (Is It So Hard)' and 'Tighter' you're well and truly spoilt for choice here whatever your bag. I had a 2 lp set that had a lot of these same songs, but it got ruined in a flood. This does a great job of replacing it. Thank you very much.